Mexifornia! Could We Be So Lucky To See It Happen? Have you heard about the rumblings coming from the left (West) coast about California seceding from the Union? Yeah, I have heard those rumblings, too. So, like a desperate poker player in a high stakes tournament, I am throwing all of my chips into the pot and calling their bluff. But….before we all get hasty about our opinion on this matter, let’s review the pros and the cons to the State of California and to the United States of America as a result of a California succession. Did you see on the news this morning that the Department of Justice is filing suit against California over the issue of non-cooperation between ICE (US Immigration and Customs Enforcement) and California law enforcement agencies? Yup. Many of the mayors of large cities in California have directed their law enforcement agencies not to cooperate with any federal enforcement agency. The mayor of Oakland warned illegal immigrants that there was an impending ICE sweep. So, if California seceded, this would all go away. Problem solved for the future Mexifornia! 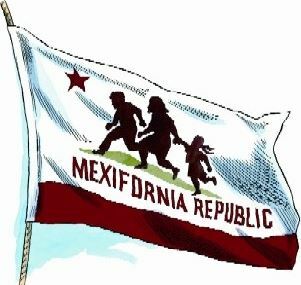 No matter if a person is there illegally, or if they have a criminal record, they would all be welcome with open arms in the new, tolerant country of Mexifornia. California has 53 Representatives in Congress. They could disband their state legislature, and these 53 representatives could replace them and save lots of money. That just leaves two US Senators out in the wind. That would be Dianne Feinstein and Kamala Harris. But think of this, maybe Dianne Feinstein could become the president of Mexifornia, as she is the senior senator, and Kamala Harris could become Vice President. For this to happen, Governor Jerry Brown would have to retire so as to not mess up the pecking order. But Jerry will be 80 years old next month and should retire. After all, Governor Jerry is responding to the DOJ lawsuit as a ‘political stunt.’ He goes on to say that ‘political stunts’, (in this case, federal laws! ), will not work in California. Way to go Jerry! Now if we could only get you to go out the door to retirement so that we can implement our plan to make Dianne Feinstein president of Mexifornia. Just think of the cabinet that could be selected for Mexifornia. The Kardashian sisters could be the joint secretaries of state. After all, what group would know more about international affairs? If experience is the best teacher, that great liberal political contributor, Harvey Weinstein should be the Human Resources director. The door would have to be removed from his office for security reasons and his office must be devoid of any sofas or couches. I would nominate Kathy Griffin for Mexifornia Homeland Security. Firstly, she scares the hell out of me, so that would make her qualified. Secondly, wouldn’t you like to see Donald Trump holding her bloody head at a White House press briefing? Just sayin’. If California seceded, they could raise the taxes on everything and everybody without recourse. If a bunch of foreign conservatives (those from the USA!) were visiting Disneyland or taking the Hollywood tour, they could have an additional 100% tariff assessed to their tickets. Nancy Pelosi would absolutely love the opportunity to assess ridiculous amount of tariffs to visiting conservatives. After all, she is the person responsible for saying that the $1000 employee bonuses as a result of the Trump tax plan were ‘crumbs.’ With that in mind, the entrance fee to visit Disneyland would be a crumby $1500 per day per person, or, in other words….a crumb and a half per person. She has also said that the latest federal budget proposal is a lot of ‘dog-do.’ How would Disney like to be paid in that? Yup. She qualifies as the new head of the IRS for Mexifornia. The new country of Mexifornia would not have to be concerned about enforcing voter registration eligibility laws. Oh wait, that is not an advantage, they don’t enforce these laws now. California follows the blood pressure theory of voter eligibility….if you have a pulse, you can vote. But here is an advantage, most of the Mexifornia citizens could vote in two countries, Mexifornia and Mexico. The next time I visit Mexico, I am going to vote in their election. Isn’t that what reciprocity is all about? A big advantage for the US of A would be that the Department of Justice would not have to enforce federal jurisdiction over the new country of Mexifornia. This would save the taxpayers money and the DOJ a whole lot of headaches. No cost for FBI agents in Mexifornia. No cost for Border Patrol in Mexifornia. No ICE agents in Mexifornia. Isn’t that what California wants? That would save lots of money for the US. Here is another advantage for the USA. The average staff salaries for a US senator is $2.8 million for Democratic senators, and $2.3 million for Republican senators. But not to be outdone, in 2011 the two California senators were 1 and 2 in having the highest senatorial staff salaries. Barbara Boxer was at $4.412 million and Dianne Feinstein was at $4.125 million for their respective staff salaries. Yup. They won and placed in the senatorial staff salary horse race. You can imagine that Kamala Harris is not far behind after replacing Boxer. That would be almost $10 million saved for the USA team. But wait…..there’s more! The average staff budgets for a Democratic representative is $1.024 million, while that for a Republican representative is $900 thousand. That would save about another $53 million. Throw in travel expenses and miscellaneous expense accounts, it would be a fair estimate that we would save about $100 million in the US budget. I have no plausible explanation as to why staff salaries are much higher for the Democrats than the Republicans. I guess the Democrats just want to spend more money. As I am the blog writer, I am going to exercise my right of literary license and insert an advantage for the succession of California that may only be of benefit to me. I would do anything not to have to hear Nancy Pelosi on the national news expounding idiotic drivel that she does so well. I have already referred to the ‘crumbs’ comment and the one about ‘dog-do.’ Yet, there she is, getting way more camera time than one nitwit deserves. I would do anything not to have to hear Maxine Waters talk about how she is going to get Donald Trump removed from the oval office, even if she has to do it herself physically. She wants to impeach him. No respect. No cooperation. Just more Californian drivel. Again, another example of getting excessive media attention. It seems that the more insane their comments..the more media attention. (I do not think I am alone in this belief.) If Elizabeth Warren from Massachusetts would move to the succeeding California, my life would be complete! Then there are the overly verbal, whackadoodles in Hollywood. These are the elite people who spend way too much time attempting to convince you that they are average Americans, just like you and me. Then they jump into their chauffeur driven limousines, head to some who-gives-a-crap ceremony, and award themselves more trophies and adoration. They spew their political opinions as if anyone gives a damn. News flash! America is waking up to the fact that most of you don’t have a clue what average America is about, nor do we care about your political rantings. Here’s an advantage to the US. Think of how much fun it would be to replace California, so we could be back to an even fifty states. Think of the possibilities! Puerto Rico? Nah. Guam? Maybe. Samoa? I would vote for the Western, free Samoa rather than American Samoa. If you have been to them, you would know what I mean. Cuba? Only by invasion, but don’t totally eliminate it. Possibly Ontario? No. Trudeau would get upset and ban Canadian hockey teams from playing in America. Bummer, eh. I cast my vote that the Virgin Islands replace California as the fiftieth state. That way, we will not have to replace our flags. Small population = less representatives. Problem solved. With all the bluster that comes out of California, here is one advantage for the US that many people are not aware. California has 17% of the population in the United States. California receives 34% of all social/welfare dollars distributed in the United States. If my math and information is correct, that means that the state of California receives over $250 billion dollars from the federal government every year. That is not chump change or crumbs or dog-do. And yet they want to flaunt the fact that they do not want to abide by federal government laws, especially those pertaining to immigration. Trump has threatened to withhold different federal funds for California non-compliance. Faster than a firecracker, some Federal judge from the left coast will place an injunction on the withholding of the funds. California getting money from the federal government is like a vasectomy….they want all the fun without the responsibility. With all of this in mind, who really needs who? California, with their already high real estate and income taxes would go bust in a second without federal government support. If I were from California, I would muzzle my politicians, replace them with intelligent people and tread lightly on the succession question. Maybe it should be left up to the other 49 states to vote if California should secede. Wouldn’t that be interesting. I think my ‘all in’ poker ploy has caused all the bluffers to fold. Another pot for Grandpa T! This entry was posted in Common Sense, Common Sense Solutions, Political Opinion, Politics and tagged Barbara Boxer, biased media, budget resolution, California secession, congress, crumbs, Dianne Feinstein, dog-do, DOJ suit against California, Donald Trump, Jerry Brown, Kamala Harris, Kardashian sisters, Kathy Griffin, Media Bias, Mexifornia, Nancy Pelosi, welfare, welfare programs on March 9, 2018 by Grandpa T.